Set in the picturesque region of Charlevoix, this magnificent hotel features unique gastronomy and spectacular views. Nestled between mountains, forest and the scenic village of La Malbaie, the hotel is the perfect year-round retreat. Winter activities include dog sledding and skiing, while summer activities include golf, tennis, hiking and whale watching. 405 luxuriously-appointed guest rooms and suites afford sweeping views and a wealth of amenities for your comfort and convenience. 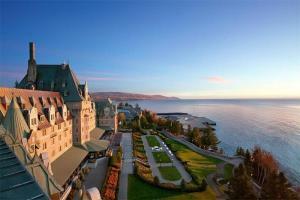 Located in the town of La Malbaie, in the scenic Charlevoix region. Approximately an hour and fifteen minutes from Quebec City.